After media coverage waned in the aftermath of the devastation caused by Tropical Cyclone Adai on Southern Africa, emergency responders and international aid organizations are still working on the ground in Mozambique, Zimbabwe and Malawi to manage the needs of millions of people effected. With the disaster striking already distressed areas in Africa, experts and agencies are looking at how can the continent proactively mitigate future natural disasters. The African Risk Capacity Group, a specialized Agency of the African Union and ARC Ltd., developed early warning systems for Africa and financial tools to serve affected countries. “Following requests from Member States, ARC has been intensively working on the development of River Flood and Tropical Cyclones Models,” said the group in a statement. The developing models will include immediate access to financing to African countries that are prone to such hazards and enable them to provide timely assistance to affected communities. “It is unfortunate that these massive disasters have happened whilst the development work for these tools is still in progress,” said Mohamed Beavogui, UN Assistant Secretary General and Director General of ARC. Mozambique, Malawi and Zimbabwe are founding members of the ARC group of nations which began in 2012. Until recently the group formed models to respond to drought conditions on the continent. In 2018 the group disbursed $2.4 million to Mauritania, which paid a premium of $1.4 million for drought coverage. The payment was the first international funding the government of Mauritania received in response to a progressively severe drought, and the funds subsidized livestock feed for pastoralists in the most affected areas. For Mozambique, nearly 1,900 square miles is underwater after the biblical proportion flooding from Cyclone Adai. Officials said there were more than 460 deaths reported in Mozambique alone, with at least 750 total deaths across the three countries. Hundreds of others are still missing and hundreds of thousands of people are displaced. Fear abounds as the cleanup is still underway that death tolls will reach into the thousands as water recedes and rescue workers struggle to service the hardest- hit areas. “The next few weeks are crucial, and speed is of the essence if we are to save lives and limit suffering,” said Dr. Matshidiso Moeti, World Health Organization (WHO) Regional Director for Africa, in an April 1 statement. “We must do everything we can to protect the people of Mozambique from a disease outbreak or other health problems caused by lack of access to essential services,” she said. To expand the emergency response, WHO has deployed experts, including epidemiologists, logisticians and disease- prevention experts, to build a viable response team. Along with death and total destruction of property, diseases like cholera is spreading rampant in Mozambique. As of April 1, a total of 1,052 cases of cholera have been reported by the Ministry of Health, and more are expected. Experts estimate over 128,000 people are high risk for the disease living in temporary shelters with unsafe water and poor sanitation conditions. “We’ve now registered one death from cholera. The person came here in a very critical condition. The deceased is the first to die from cholera inside our health facilities,” announced Ussene Isse, Mozambique’s National Director for Medical Assistance, on public television. Cholera is an acute diarrheal infection caused by ingestion of contaminated food or water. Researchers have estimated that every year, there are upwards of four million cases, and 21,000 to 143,000 deaths worldwide from the disease. Planning for cholera has been one of WHO priorities in its support to the Mozambique Ministry of Health. It opened 500 beds in seven cholera treatment centers across the affected area, with plans to boost the capacity significantly to cope with an expected increase in cases. Nearly 900,000 doses of oral cholera vaccine from the Global Alliance for Vaccines and Immunizations (GAVI) arrived in Beira, Mozambique. The government and groups, including UNICEF, Federation of the Red Cross, Médecins Sans Frontières and Save the Children, are setting up a vaccination campaign to mitigate the disease. Other aid groups like the Red Cross/ Red Crescent can be contacted by victims of the disaster to list their names in a data base for the status of the missing. A public website was established for people who have lost contact with their loved ones that allows people to list their own names and status. The “Restoring Family Links” is used in disasters and conflict areas. 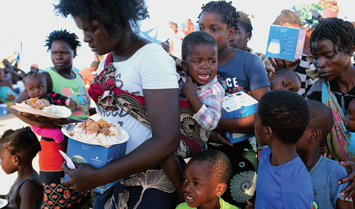 The website is available in English and in Portuguese, Mozambique’s national language. Save the Children also reports a growing number of missing and separated children in flood-devastated Zimbabwe. “The people are traumatized, they are mourning and have not found the bodies of their loved ones,” said Shepherd Zvidzai, an education program officer at Save the Children-Zimbabwe.